In a coffee bean blender, blitz the Full Leaf Green Tea until a fine powder is formed. Combine all the dry ingredients, including the tea, and the egg in a kitchen aid bowl and place onto a machine with a paddle attachment. Combine the ingredients together and then slowly rain in the water until just combined. Take the dough out of the machine and knead the dough. It should be a little stiffer than bread dough. The dough is ready when it does not stick as much to the bench. When it is the right consistency, you will be able to lift it from the bench and it will fall off after about a second. Cover the dough with a damp cloth and allow to rest for at least 30 minutes. After the resting time take the dough ball and sprinkle some flour generously over the dough. Take a rolling pin or roller and start stretching it. It needs to be 1mm in thickness, if it starts to stick use more dry flour on the dough. If it starts springing back to its original shape, let it rest for a minute or two. Place a sheet of dough onto a cutting board and spread flour on the surface. Fold it two times in the same direction, each time spreading flour on the surface and then on the top. Once it is folded in a strip, start cutting it. Once there is a pile of cut noodles, toy at them with your fingers to unfold them. Toss them around with some more flour; just be careful not to break the noodles. In a large pot, bring water to the boil and add salt. 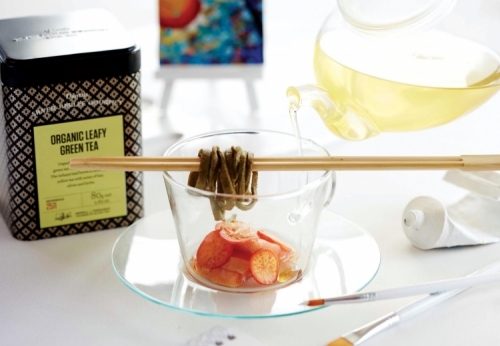 Place the water and the green tea leaves into a container and stir. Leave for 8 minutes, stirring at least twice during the time. After 8 minutes strain the cold tea and discard the tea leaves. Stir in the miso paste. Strain the broth through thick white cloth to gain a clear colour. Place into a clean glass teapot. Combine the water, salt and brown sugar into a saucepan and place over medium heat. Heat the mixture up and stir until the sugar and salt has dissolved, do not boil. Take the mixture off the heat and allow cooling to 40°C. Meanwhile place the salmon fillet and tea into a deep container with enough room for the wet mixture to fit as well. Pour the brine over the salmon until it is completely submerged. Cover with glad wrap and place it in the refrigerator to brine for 30 minutes. After 30 minutes remove the salmon from the brine and pat dry, removing any tea leaves. Slice into very thin strips and reserve until needed. In a small saucepan, bring the sugar and water to a boil. Meanwhile slice the radishes as thin as possible and place into a container. When the sugar syrup has come to the boil remove from the heat and stir in the sushi wine and orange food colour. Strain over the radishes and cover. Reserve until needed. In a small sauce place ponzu dressing, then whisk in the sugar and Iota. Whisk together and bring to 80°C and when the gel has reached the temperature take off the heat and pour into a container. The gel needs to be 5mm high, allow to set and reserve in the refrigerator until needed.